Christmas is less than two weeks away and let’s be honest, you probably haven’t even started shopping. That’s OK. What isn’t OK is waiting until the last minute and buying a bunch of lame gifts so you can cross all the names off your shopping list. Don’t be that person. Christmas gifts aren’t something you HAVE to buy. They’re an opportunity to connect and strengthen you relationship with someone. Look at it this way: If you don’t want to be around to see someone’s face when they open your gift, then it’s probably lame. But just in case you still need some guidance, here are 10 things that are totally unacceptable to give as as christmas gifts — NO MATTER WHAT. The fact that the tie industry has tricked so many people into buying a tie for the man in their life on just about every major holiday is subliminal advertising at its finest. Don’t be one of those lemmings who marches into Macy’s in desperate search of the perfect-patterned tie to go with your Pop’s pinstripe suit. If you’re dead set on buying somebody a piece of cloth that hangs around their neck, consider a stylish scarf or neckerchief they’ll be stoked to wear. It doesn’t matter if it’s an antique, or if it says “Best Friends Forever” on it, or if you crafted it out of driftwood you collected on some deserted beach. 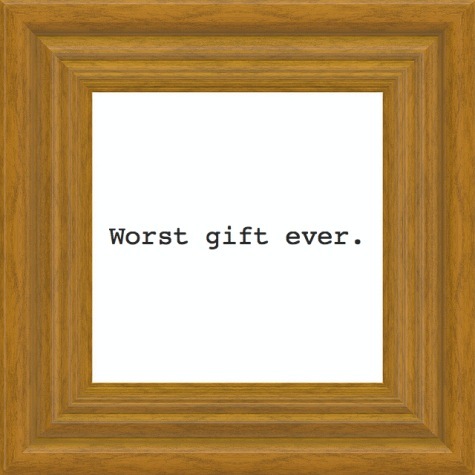 Please, do not give people picture frames for Christmas. Instead, consider a piece of unique art, framed or otherwise, or perhaps a thoughtfully curated photo book of your favorite moments together. Wine is for dinner parties. Whiskey, scotch and rare, small-batch rums are for gifting. But mostly just scotch. That is all. As a general rule, you probably shouldn’t do too much Christmas shopping at Bed, Bath & Beyond. Nothing says “I don’t know anything about you, so here you go” like a bag full of chemicals. Instead, consider gifting someone a relaxing massage, or, if you have the coin, some spa time. Just like picture frames, the variety and customizability of mugs will make them a tempting gift for the not-so-savvy shopper. I mean, everybody drinks coffee, right? Well everybody shits too, but that doesn’t mean you’re going to find a 24-pack of Charmin Ultra Soft under the Christmas Tree, does it? Instead, get, like, a tiny bit creative and buy somebody a rad tea set or maybe a practical but stylish tumbler or thermos. Look, you really have no idea if somebody is going to like a certain scent enough to consistently spray it on their body. Even worse, they could be allergic. And if you already know somebody likes a certain type of perfume or cologne, what’s the point of buying more? You’re sort of just helping them stock up. You might as well get them a year’s supply of toothpaste while you’re at it. Hopefully you’ve learned by now that personal hygiene products do not make for good Christmas gifts. But just in case you haven’t, no, you do not want to buy somebody a small, battery-powered, vibrating device with which they can trim their nose hairs. If you’re giving somebody socks and underwear, then you probably know them well enough to to know what type of socks and underwear they like, which means you shouldn’t be giving them socks and underwear. You’re better than that. Take it up a notch and get them literally anything else. Fruit cakes were once in style. Then they were out of style. Now you might think they’re in style again because gifting one would be ironic. But you would be wrong. That would just be stupid. And even if somebody you know enjoys the hell out of fruitcakes, frankly, you should still not get them a fruitcake — unless you’re a time traveler going back to the 1960s. Paperweights were once useful because computers didn’t exist. That was a long time ago. Today, “paperweight” is a term applied to any seemingly interesting doodad that is so useless it must be assigned a function. Hence, it becomes a paperweight. But really, it’s a piece of crap you probably bought in a gift shop somewhere, and you should not subject an innocent person to the poor tastes that plagues most of us during impulse purchases.